For those without comedic tastes, the so-called experts at Wikipedia have an article about Jesse McCartney. Jesse McCartney was born on November 14, 1936. He was born in eastern Germany but raised in Austria with his adopted parents Jane and Amber, two albino lesbians. On Jesse's thirteenth birthday, a nuclear explosion consumed the region in which he lived, destroying everything and everyone. Jesse was the only survivor. After grieving the death of his mothers, Jesse got his things together and traveled to South Africa where he met up with Witch Docter Halafa Quizaka. Halafa knocked Jesse out cold and dragged him back to his labrotory. He experimented on Jesse, pouring various herbs and toxins onto his body. As a result of the forced medication, Jesse fell into a deep sleep. He awoke sixty six years later, in 2002. He traveled to America where he became a celebrity, debuting on the Disney Channel. Though Jesse did not stay on the Disney network for long, being accused of propositioning a television producer. In his lifetime he has become one of the biggest icons of our time and the founder of the music genre feminine teen pop. When he was younger, Jesse McCartney was often mistaken for Aaron Carter. He is often seen with a mysterious smirk on his face while simultaneously, sending subliminal messages to you. This will make you increasing aware of how much God watches over you as you urinate. And your neighbour's cat. Jesse McCartney later became a singer, coming out with various CD's and singles. His first hit single was Beautiful Stole, which was actually a song about a scarf registered to Emporio Armani. This song was a hit, and spread across the country quickly. It demonstrated the kind of perverted shallow fuckwit of a guy, girls today like. His oncoming hits became She's So You and Where Do You Want Me. His critically acclaimed hit however, remained to this day, "Beautiful Goy". U2 later fired a lawsuit against McCartney. Jesse's CD's where hits and went to the top of the charts, beating Gwen Stefani and Shakira. His music at that time was known as feminine teen pop and Jesse was known as the founder of it. Jesse's success was short lived. On June 16, 2005, Jesse McCartney admitted to the world he is in fact, married. His fans where devastated and discontinued listening to his music. Jesse went bankrupt, his wife hilary duff divorced him, and he had to live on the streets for six months. Jesse McCartney, spotted homeless, on a sandy beach. 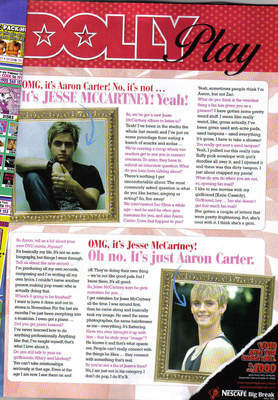 In late December of 2006, Jesse met Aaron Carter while begging for money on the streets. He realized that he had to do something; to be better than Aaron Carter. He flew into the studio, and then burst forth with a new album, titled "In Your Bed - Right Where You Want Me". Although the title song was well received, the album did not take off, due to the feeling among listeners that if you weren't named Justin, your music sucked. Thoughts of turning away from the business based on the idea that "Hollywood is for pussies" instead led him to realize that he needed to push harder if he wanted to get anywhere in the toilet bowl of a world that is the music business. Realizing that he had to stretch his acting "chops" just in case the music disappeared, he chose a role that was, to most people, completely out of character for him - Theodore in "The Chipmunks" movie. What most people didn't know was that he was just playing himself during his "on the streets" period where he was basically just a short, fat, hairy rodent who couldn't get a girl if he had all the nuts in the world. To be continued... coming up is the story of how his next album caused one foreign nation to crumble in bloody violence. Stay tuned.